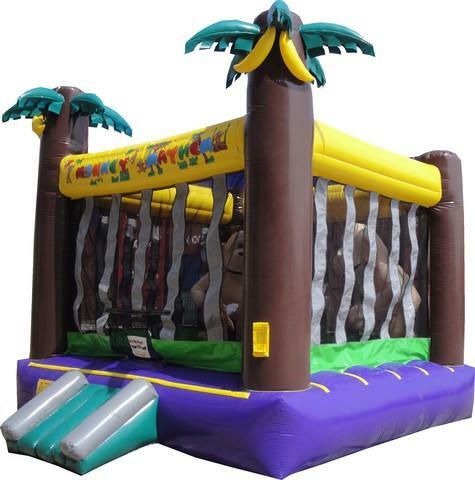 Whether you're having a jungle, monkey, or a zoo themed party, the Monkey Mahem bounce house will complete your party. From the time the kids see the bounce house go up, they will be going bananas. There are two very large and realistic inflated monkeys inside the bounce house. The fun color scheme and the large monkeys inside create smiles and fun all day. Kids ages 2-12 will be best entertained by this bounce house, but all ages are able to enter the zoo and have fun with the kids.You can't go wrong with this bounce house for your adventurous kids. They have the space and freedom to bounce all day with the large monkeys inside! While pretending they are at the zoo, or actual zoo animals themselves, the Monkey Mahem will keep the kids monkeying around! Let this bounce entertain your little monkeys at their next party. This jungle themed bounce house is one of our larger bounce houses at 15ft X 18ft. The following safety features are included to ensure the bounce house is safe and fun: entry step, netted windows for ventilation, and full view of the kids while they play. The entry step allows for smaller children to enter and exit the jungle easily. There is also a top screen included to help guard those harmful rays from the hot Texas sun. As with all of our inflatables, you can feel secure knowing this bounce house is inspected and approved with the state of Texas for safety. Another perk from renting from Inflatable Party Magic is all of our inflatables are cleaned weekly and kept in pristine condition. If you would like to reserve this Monkey Mahem bounce house, simply press add to cart or start reservation above. It will walk you through the steps to enter your information and send you an immediate confirmation email of your rental. There is a $50 non-refundable deposit to hold the Monkey Mahem bounce. With this bounce house, you do have the option to pick it up yourself and set it up for a cheaper price, or you can choose to have Inflatable Party Magic to deliver and pick it up for you. If you should need any additional information, please feel free to contact us. We are always available to assist you with your order.